Old Court Ale– An American ale that reserves its right to be different. A bit lighter in body, Old Court provides a citrusy hop aroma and caramel finish. 16 Mile names this ale for Sussex County’s original courthouse, which has been serving judicial needs since 1791. Today it stands on South Bedford Street just south of The Circle in Georgetown, Delaware. The beer pours a clear dark amber with ruby hues and an off white head. The nose is nice with caramel malt aromas along with floral hops and an underlining earthiness. Not a bad first sip but there is an underlining harshness to this beer. The taste starts out with a caramel malt sweetness up front, then a cleansing effervescent over the tongue in the middle of the sip. The back-end is fairly easy drinking but there is a unique harshness and hesitation at the top of the swallow. There is a carbonation release during the swallow that masks any flavors. The finish has some nice caramel malt flavors and a slight hop bite to it. But there is also a harshness to the finish. The final aftertaste has some malt sweetness but mostly a green apple tinge or harshness. All and all this is not a very enjoyable beer. It really drinks more like an Adjunct Lager than an All Malt Grain Ale. This beer is only at 56 degrees and it has really picked up some off flavors. This is just not good. This may be a first and not in a good way. This is my 285th review and this may be the first beer that I don’t finish. It is hard to believe that a craft beer can taste this bad at 61 degrees. I am really having a hard time swallowing this beer. Well this is it. 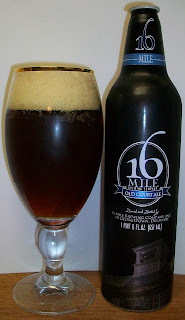 16 Mile has produced the first beer in 285 that I’m not going to finish. I just am not going to torture myself any more. If this was a 12 oz bottle I would have been able to finish it. But it was not worth trying to force 22 oz. I’m not sure an F is fair but a D- seems too generous. This beer started out as a drinkable ale but it sent down hill fast. Each sip continued to more harsh until at only 61 degrees I could not take it any more. Now there is a possibility that I got a bad bottle/can. I heard that they are moving to standard 12 oz glass bottles. I may review this again when that happens.